Click to play HUGE – Make sure to play with sound! 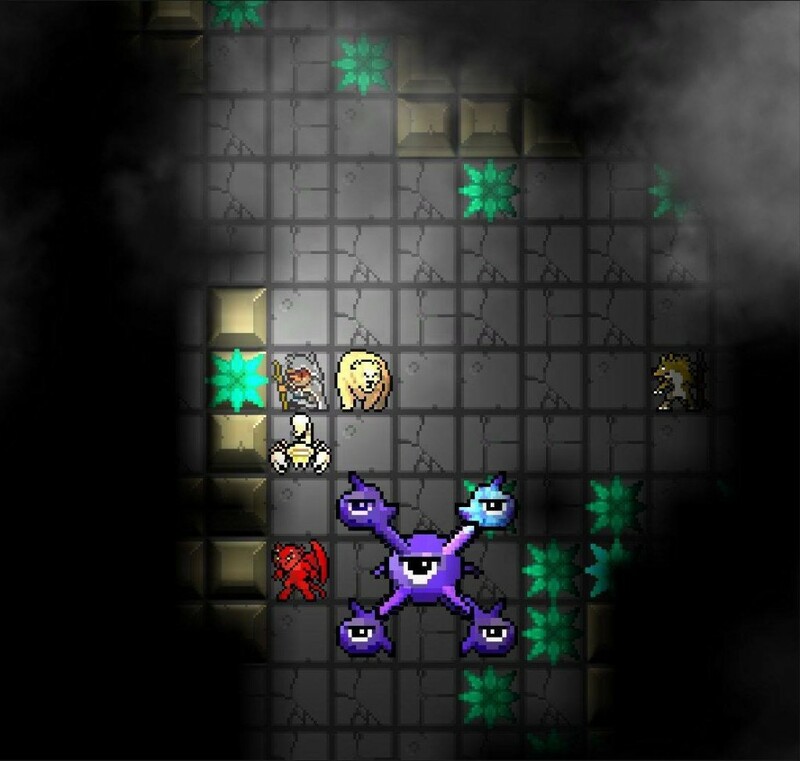 Huge is a 2D tile-based “RPG Lite” in the roguelike vein. The player must venture through the caverns in search of crystals that can be used to craft bombs. Why do you need bombs, you may ask? Well, there is a boss wandering the map out there, and you can’t defeat him without them. It’s a concept I’ve always found interesting in a “Hunt the Wumpus” sort of way… except along the way I realized I was making a Rogue version of Sinistar, so I decided to just take that idea all the way to the mat. Additional note: The above build includes a fix to the Unity default quality settings, which were preventing the bump-mapping on the sprites from appearing, as well as a simple title screen wrapped around the experience so that the user doesn’t have to reload upon death anymore. If you want to play the original exactly as it was released, go here. Additional, additional note: The build linked above has been converted over from the Unity Webplayer (which has become non-functional in most browsers) to a WebGL build that has a few sound issues. To play Huge in all its glory, click the download link above instead for a Zip archive. The game was built solo over the course of a (regular work) week, in my spare time. 7 days isn’t very long to do what I had to, so I had to cut corners in a lot of places, such as having a proper progression if you succeeded. I also didn’t really get a ton of time to balance it, so defeating the boss can be easy or hard depending on how in the groove you get. Finally, I wish I could have given the boss some more character, but such was the way of things. Most of the audio was created by my talented friend and coworker Mark Shoemaker. Collect crystals to build bombs. Use bombs to defeat the Boss. The player can be moved around the map using the WASD keys. Move into a monster to attack them or to use a workbench or chest. Collect swords to increase your attack, and shields to increase your maximum health. Collect crystals from chests, monsters and lodestones. By using a workbench, you can exchange 5 crystals for 1 bomb. Place bombs by pressing the  key or [ENTER]. Bombs will explode after 5 moves. Kill all 4 eyestalks on the boss in order to win. Music and sound by Televided.